The Solivita bed from iNSPIRE Q® Bold is simple, but meticulously detailed to make an elegant presentation in your home. The showstopping piece features an upholstered headboard insert framed with a modern metal poster for an ultra luxurious look. The Solivita bed combines a classic fairytale canopy bed with modern styling and lines. Its beautiful frame creates the perfect atmosphere for an elegant bedroom, and its sturdy construction ensures you will enjoy it for years to come. Available in full, queen, and king sizes, the Solivita fits perfectly in almost any space and easily matches your modern decor. Assembly required. This product ships in two (2) boxes that may arrive on different days. It’s a nice sturdy bed. I have a king mattress but it does not reach all the way to the back. There’s about an inch of space so my pillows have room to fall which I’m not happy about. The bed is stunning. Very sturdy. 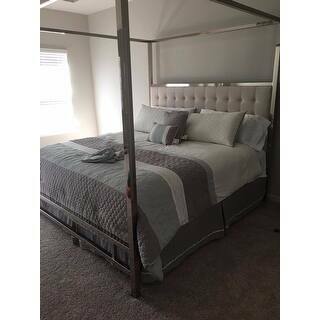 I got the king size bed in the chrome metal finish with the dark grey linen headboard. Came in two boxes -- the headboard in one and all the metal beams and hardware in another. Took my husband and I about two hours to put together completely. I'm not sure why most of the reviews on here complain that this was difficult to put together, or time consuming to put together or frustrating to put together. I found none of that to be true. You definitely need two people for assembly, just to make things easier. But honestly from start to finish, this was less than two hours of work (some of that time included vacuuming and cleaning where the old bed used to be). The instructions were actually clearly written. All metal pieces were labeled with a sticker with a letter on them to match to the letters given in the directions -- so you literally connect part A to part B and so forth. The pieces are held together with Allen type screws, so you need to use the little L shaped device they give you in the box to screw them, or if you have an Allen screw set in your tool box, use that instead. Not sure why everyone is complaining about the screws being difficult to deal with. If you like this bed, get it, you won't have any problems putting it together. I am not particularly well versed in furniture assembly and this was totally manageable. Beautiful, sturdy, no squeaks. I purchased the king bed. I read all the reviews about the difficulty of assembling and accepted the challenge. As a single woman I was able to assemble the majority of the bed myself. I used books to prop the foot portion of the railing while I secured it to the headboard. I did need help with the fabric portion of the headboard and top railings. As others have said, the area for the screws is extremely tight and tiring to do. Overall great purchase. I am pleased with the quality of the bed frame and headboard insert. Unique and pretty. We were missing our instructions but able to figure it out. It was pretty easy to put together. This bed is gorgeous in person. Words can not describe how it looks. It did not take long to set up at all. It is sturdy and great quality. I ordered the gray headboard. I honestly can't believe how beautiful it looks and I didn't have to break the bank to get it. I've already bought dressers/nightstands,pillows, and still trying to decide on which lamp. I have to remember that I share this room with my husband and not make it to "girly". In the pic I'm adding my newborn is enjoying the new bed as well. Also I still have the 2 different lamps, so help me decide which one to keep. A little wide, but perfect!! I love everything about this bed!!! have to clean the silver once in awhile but it is very shiny and beautiful! only complaint is I have a cal-king bed and i still have extra space on one side, almost a foot! definitely does not fit a cal-king right but possibly would fit a European king better. There are 51 screws to install, and 30 of them took an absurd amount of time and blind precision to accomplish. .My handy husband put the beast together and, once completed, stated that if we ever move, he is leaving this bed behind because it is just too much work to ever deal with again. However, it looks fabulous and seems sturdy. I absolutely love my new bed! I have a memory foam mattress so you will need a box spring. Also if you like it kinda high, you want to consider getting something over 10 inches as well. The only this is that I have a ceiling fan in my bedroom, and because it’s so tall, we can’t get the headboard flush against the wall unless we remove the ceiling fan. Also, make sure all the bolts and screws are tight or it’ll make a squeaking noise. This "Goddess" of a bed is a sweet dream (no pun). Super sturdy and no squeaky sounds as I suspected. I've tested 500 lbs on it and it holds up like a champ. It took my hired help a mere 35-40 mins to put it together by himself with his drill (and that time included putting together a metal framed box spring built inside the frame of the bed)! The box came in 2 parts (very heavy) so I opened and separated the pieces which made for much easier moving. Great price as well! The bed is gorgeous in person. Its definitely a princess bed. I wake up smiling! The bed is pretty sturdy and for a good price.. I got it for 651... I put the bed together all by my lonesome. It took about 3 hours. I do feel as though the directions could be more detailed. Install the bed in the upwards position most people do not have the clearance to turn the bed around with lower ceilings. It takes awhile to put together you need a min of 2 people but 3 would be better. If you have bing hands you will have lots of problems. Bed is sturdy and sleeps well. I just absolutely love this bed. 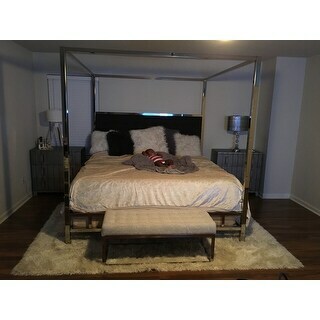 Before I even closed on my house, I knew what bed I wanted and this was it!!!! It's not only beautiful, but very sturdy. I am a female and I put this together by myself in about 45 minutes. My UPS delivery lady was very mad because it's heavy as hell and she had to drag it out the back of the truck. The hardware and instructions were missing, support said that they could not send them. This bed has exceeded my expectations. It is so much better in person and every one that sees it falls in love with it as much as I have. Great product. So reasonable priced, good quality! Just be prepared for the assembly if you’re going to do it. I recommend two people or more, two can definitely get it done. Easy to assemble! Love it no complaints! Looks great, just like the photo. I love it ❤️ Very sturdy!! The only thing I didn’t like was the fingerprints!!! If u have little ones u will be wiping every other day!!! Beautiful bed, no doubt. But it was delivered with bent and scratched poles. It wasn’t until I had it 90% out together that the last few poles had scratches and one was bent making it really hard to connect. I had to take a screwdriver and pry it. This bed exceeded my expectations! Initially I was super nervous about purchasing a bed that I was not able to see in person but this bed is sturdy, wide, shiny and lovely. I recently purchased a new home and it pulls my bedroom together without doing a lot. I found a great discount online and it was so well worth it. I assembled the bed by myself which took me 3 and 1/2 hours (would of been 2 hours if I was not multitaking). 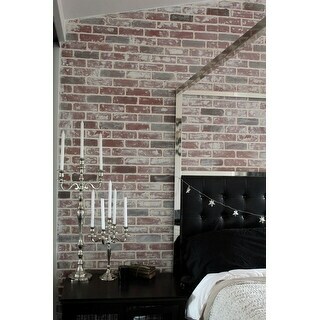 This is the best purchase that I have made on overstock thus far! 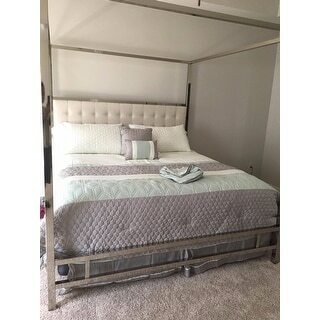 "I got this bed frame weeks ago but unfortunately the king size mattress i bought didn't fit in.Please can you tell the exact size of mattress that will fit into this frame and if you have one on overstock,kindly send me the link.Tanks"
We recommend using a standard size king mattress. The king-size mattress dimensions are 76 inches wide by approximately 80 inches long. "My bed didn’t come with instructions on how to put it together? " "Does the King bed fit a California King mattress or an Eastern King mattress?" Hello, this king bed would fit an Eastern King mattress. "Hello, I'm buying the p5 sleep number mattress set, would I be able to use this frame with that type of bed? thanks!" This bed is compatible with an adjustable base. 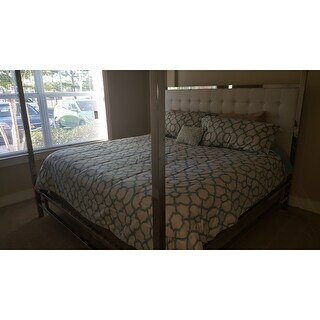 "I purchased this bed about one year and 3 months ago. How can I clean the white linen headboard? Also, is there an option to purchase a new back headboard piece separately? " We recommend spot cleaning the fabric. We do not currently sell the headboard separately. "I have a narrow stairway and I was wondering how many pieces this bed comes in." This bed ships in two boxes. "I have children. In the event I’m not home and they decide it’s playtime and swing on the canopy. How much weight will the canopy hold?" The canopy has not been weight tested. I am not sure how much weight the canopies can hold but what I can say is that they are super sturdy. I have had this bed for a while and there is still no movement. I would have expected some loosening, but not at all. Very solid!